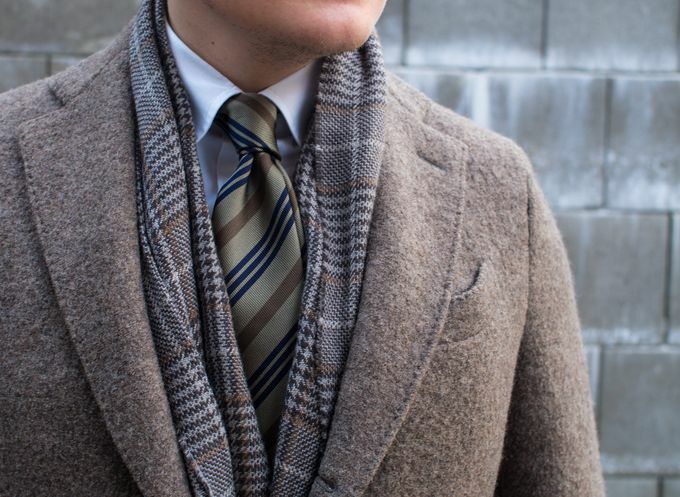 It's some time now that I've been going on about super repp and jacquard ties. 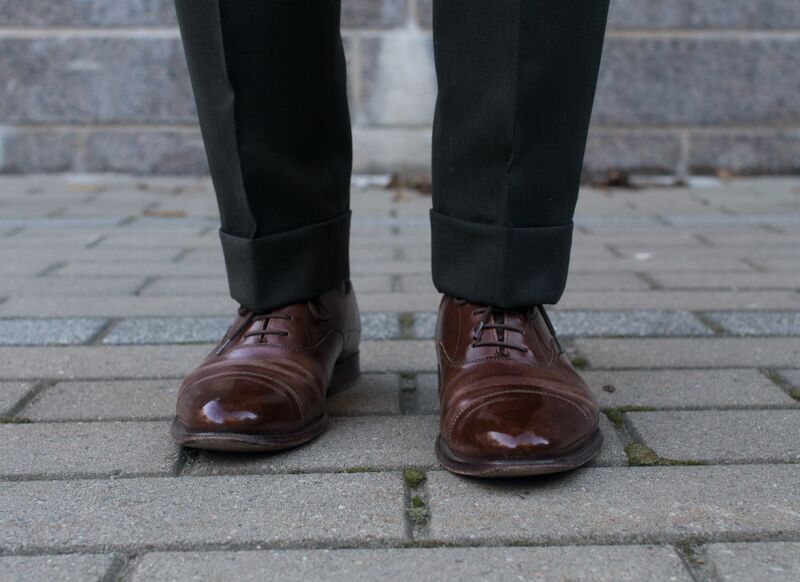 The way I see it is that these types are slowly gaining a new foothold in the classic menswear scene. A nice super repp tie is naturally a timeless classic, but it has been a reasonably rare sight in the past years. Instead, this space has been filled with striped shantung silk ties and all sorts of iterations of grenadine ties. As for jacquard ties, they've been basically non-existent, but I'll touch that subject on a different text. 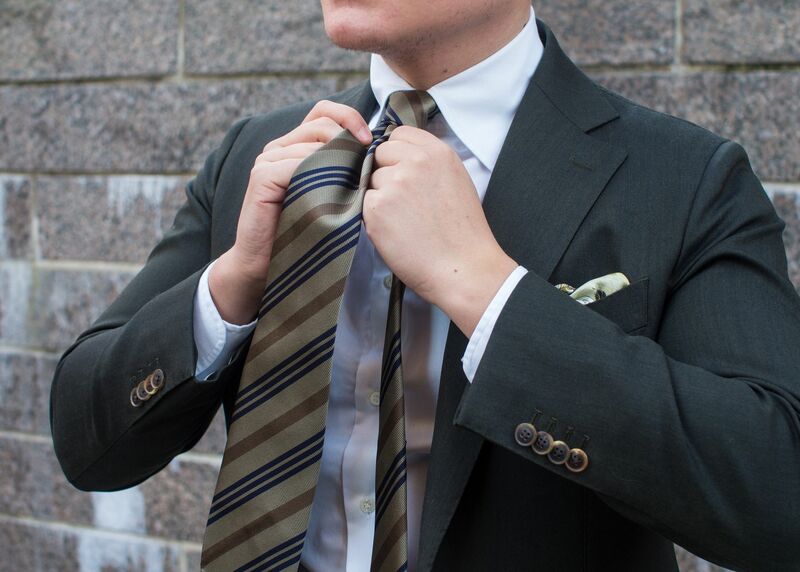 In any case, a classic handrolled super repp tie is a silk tie woven into a stripe pattern. 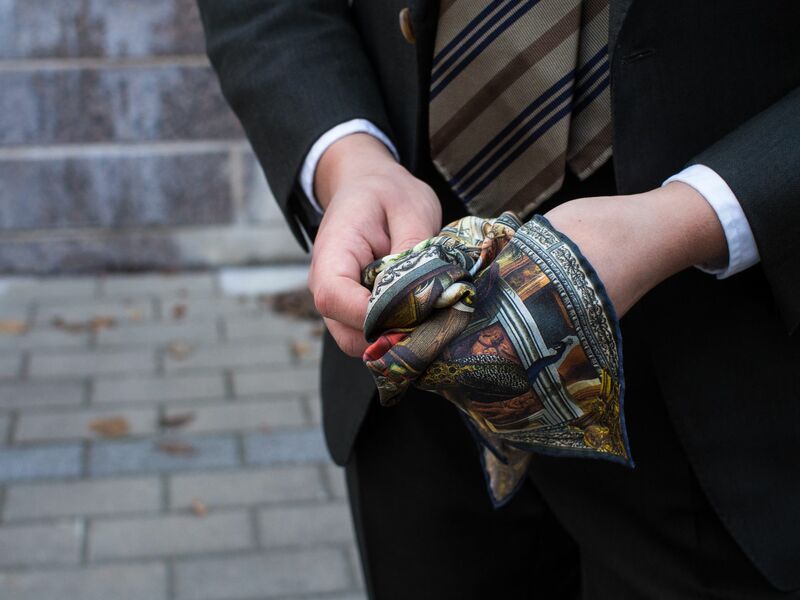 When handrolled and made with a heavier silk these make excellent semi formal ties. 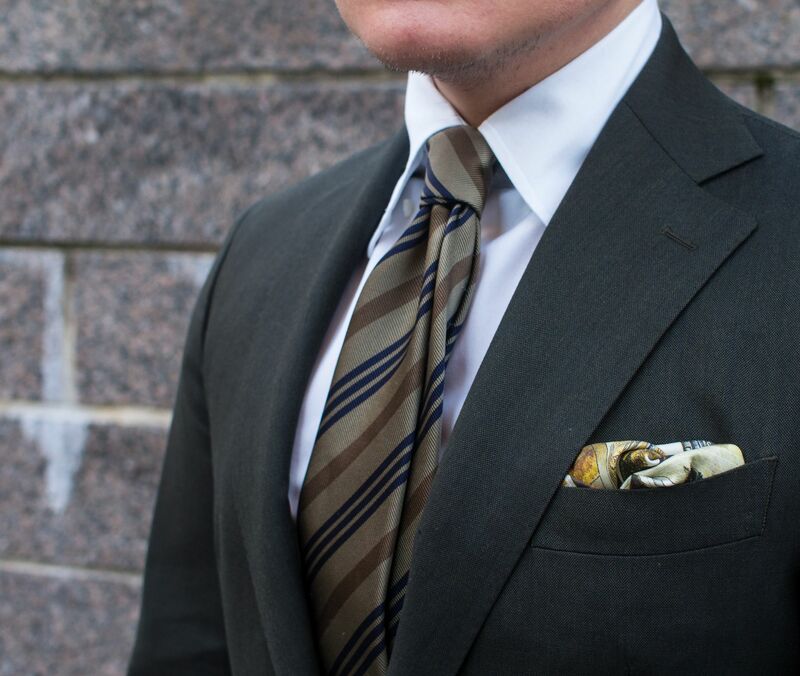 That said, if the twill texture is less visible a super repp tie will easily make a great formal business tie too. 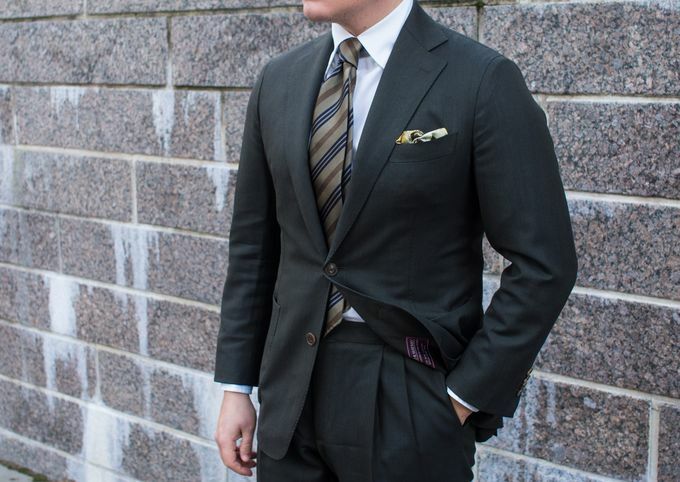 The tie in today's post is from Drake's and definitely on the heavier side, so I would wear it comfortably with a work outfit such as this but would leave it home with my more formal navy suits. The worn items include a Vaatturiliike Sauma mtm suit from Holland & Sherry's wonderful Crispaire fabric, mtm shirt from Luxire, super repp tie from Drake's, silk pocket square from Rampley & Co, braces from Viola Milano, socks from Jeeves, shoes from Alfred Sargent, coat from Lardini and scarf from Berg & Berg. The weight of this Drake's tie is on the heavier side. It remains well-balanced, however, and has a nice thick feel to it. Good for a single dimple knot, not too good for other types of knots. Dark green is a great companion to khakis, beige and other colors similar to them. 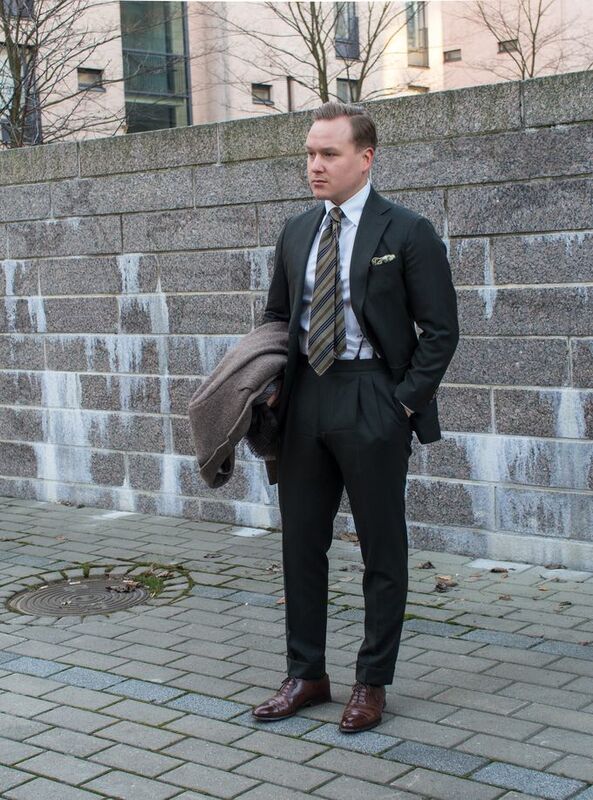 The suit's Holland & Sherry label having his moment in daylight. Rampley & Co's the Annunciation pocket square. Alfred Sargent for Herring Shoes, basically AS Moore but with regular soles. I've used this pair a lot over the years, and they're actually in a dire need of resoling. Might send them over to Shoe Healer this spring. Different shades on beige, khaki, orange and brown. Because why not.